The day of Lord Shiva. It is the day, when Lord Shiva, rises from his prolonged Samadhi at 12 in the night. 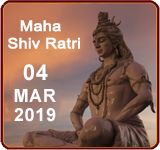 Shiv Ratri is a major festival observed by the disciples of Gurudev. It comes about 40 days after the day of “Ganesh Chaturthi” every year. Starting from the morning, on the day of the festival, people offer their prayers at the Gurgaon sthaan and offer “Bel” (A fruit), “Bel Patra” (The leaf of Bel) and “Dhatura” (Another fruit). All these are liked by Lord Shiva. Likewise, a “Nirjala” fast ( Fast without consuming even water ) is kept by all on this day. The fast is broken after midnight with “Alu Ka Prasad” and “Nimbu Ki Chai” ( Lemon Tea ). Prasad is distributed at Gurgaon to all. This Prasad is unique, in the sense that Gurudev himself created it for his disciples and Bhakts. Since people from all over India come to join in this festival, the arrangements of their boarding and lodging is done at the trust building in Gurgaon. Langar starts 3 – 4 days before the festival and is carried on till 2- 3 days after it.